Leaving the bus in the field was supposed to be lesson to us, but, for years, we all walked to the high school without complaint, rain or shine. Back then, while the rest of the world was getting more and more connected, everyone showing up in each other’s pockets all the time, our town had slammed the gates shut. Not literally, of course, people could still come and go as they pleased, but no one in town had access to the internet. No one had smart phones. The Council had decided that those things weren’t good for the town, especially for the children, so they passed a by-law against them. If Lorne hadn’t needed to see a specialist in the City, we might never have known about the talks. He brought a poster back for us all to see, a free event with speakers from all over the world. Big thinkers, big ideas. Once we saw it, we knew we had to go. I don’t remember whose idea it was to steal the schoolbus to drive us all to the City, but I know that Jenny drove. She knew how it all worked because her Dad drove the bus every morning before heading to his shop. There were only 14 people in our high school, we didn’t even fill up a whole row in the auditorium. We drank in each speaker’s words like we had spent our lives in a desert. We chattered excitedly the whole way home. We were going to do things, we were going to make changes. Jenny got us safely there and most of the way back but about 10 minutes outside of town, we saw Sheriff Rolfman’s car parked across the highway. Since she didn’t think she was going to be able to stop in time, Jenny veered off into the field. The momentum carried us pretty far, and the bus got firmly stuck, but none of us were hurt. We were all grounded for weeks but that just gave us more time to think. 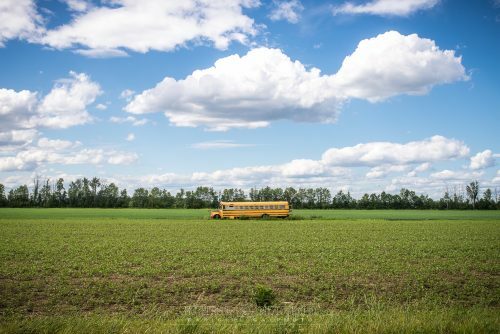 Leaving the bus in the field was supposed to be an extra punishment, something to drive the lesson further home, but, for us, it was a sign of our triumph and we reveled in it. We were parked out in the middle of the field. It was a lark. We sat there for hours, sitting in the very back, where all the bad kids sat, where you get the highest heights when the bus wheels fell into those deep pot holes and then climbed out again. The hours passed. Talking to him was so, utterly, ordinary. His speech was like listening to a water fall. The dew fell on the bus as night time enveloped us. We told each other our stories well into darkness and stars.